Basically, 555 timer is an 8-pin integrated chip which has capable of producing accurate time delays or oscillation. By connecting different values of resistor and capacitor to a 555 timer we can use it for countless applications. Once we power up the circuit, there is no stable state in the output. 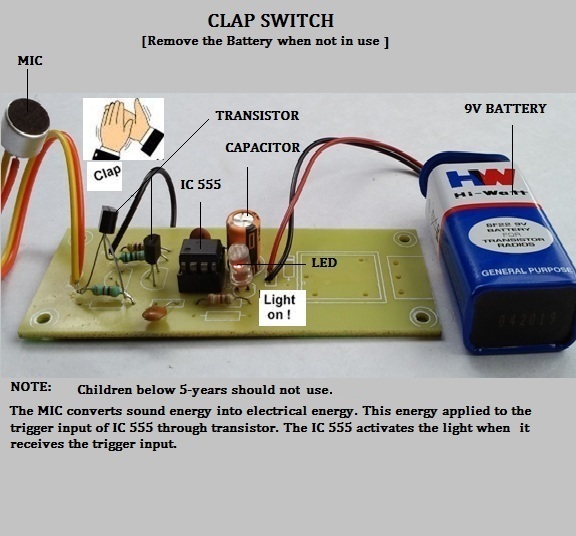 Means, it will oscillate at a particular frequency depending upon the RC (resistor – capacitor) values connected with the 555 timer. Either we can increase or decrease the frequency by changing RC values. In simple, its an one pulse mode. By default the output of this circuit will be low (‘0’). when we give a low signal to a trigger pin. The output will goes to high (‘1’) for a certain time and it will come back to the low state. The time for which the output stays high can be controlled by a suitable RC values. “ It is possible to set the output either high or low, by providing low values for a particular ‘ TRIGGER’ or ‘ RESET ‘ pin.” In this circuit, we have two switches called ‘ TRIGGER’ and ‘ RESET ‘. Once the TRIGGER is set to LOW, the output will stays HIGH until the RESET set to LOW. Our aim is to switch on the light for a particular time..
so for this kind of application obviously we need to use MONOSTABLE mode.